There are about 1,500 active volcanoes on the Earth’s surface, aside from the continuous belt of volcanoes on the ocean floor. Most of them are positioned along the Pacific Rim — known as the “Ring of Fire” — the most seismically and volcanically active zone in the world. About 500 of these volcanoes are known to have erupted sometime in recorded history, but around 50 of them erupt each year. To timely identify volcanoes presenting greatest danger is vital for more than 500 million people living close to an active volcano. 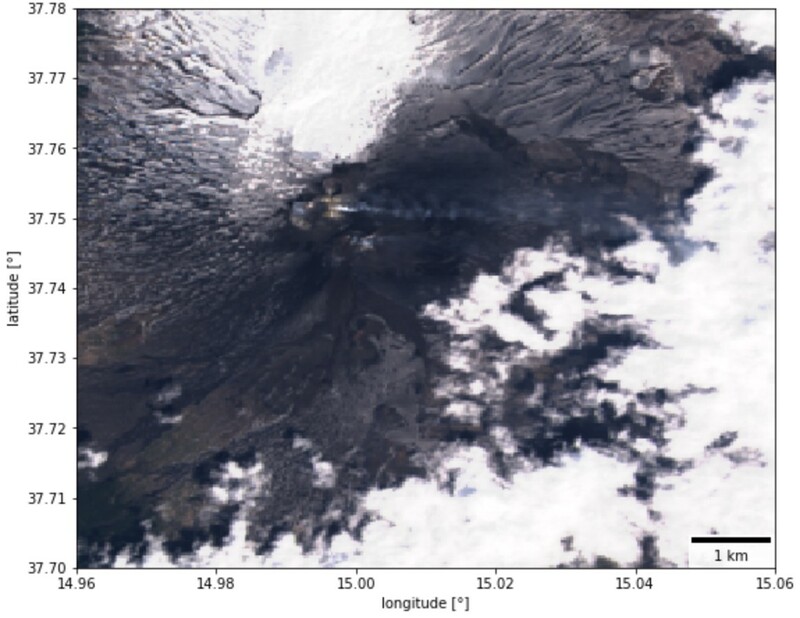 Monitoring from space helps to detect the slight signs of change, assess and predict the potential risk, and manage the response during the eruption and in the aftermath. To react on time, the authorities rely on the crucial data provided by the Copernicus program. Volcanoes are studied with both multi-spectral and radar instruments, showing various occurrences correlated with the eruption. Data from instruments onboard Sentinel-2 and Landsat 8 provide different spectral bands of the same ground target, ranging from visible to far infrared. 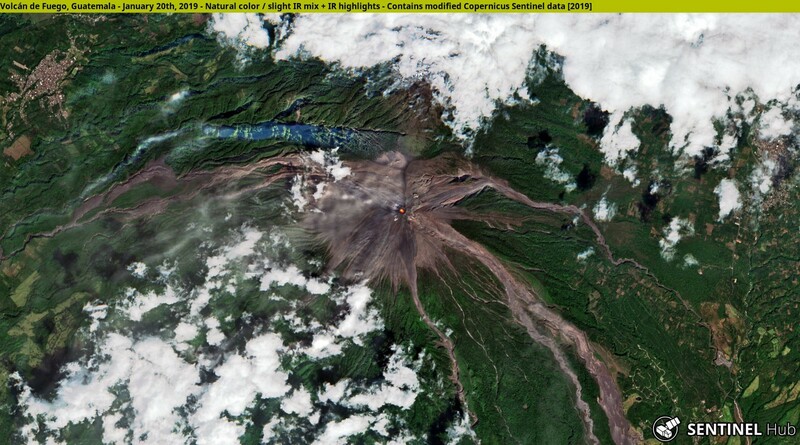 Besides, Landsat 8 also provides thermal bands which are quite useful for observing volcanoes. 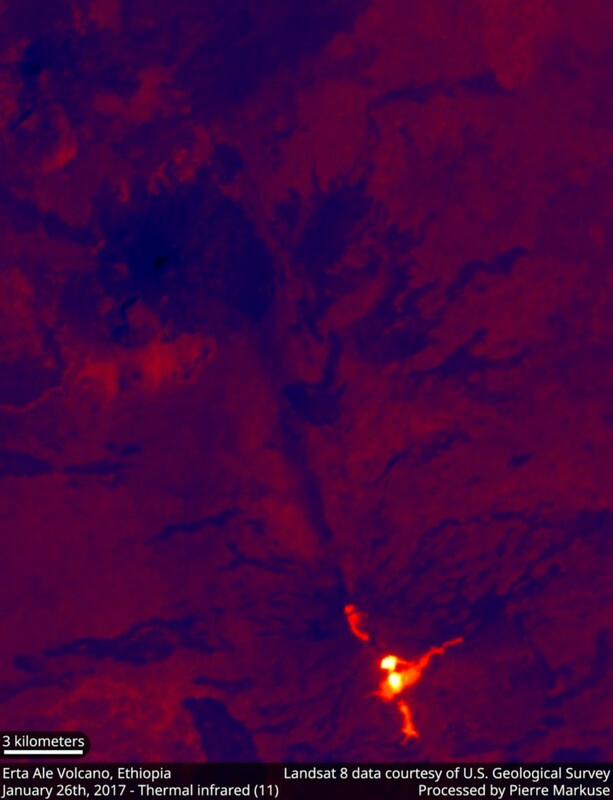 Erta Ale Volcano, Ethiopia acquired by the TIRS instrument aboard Landsat 8 on January 26, 2017 (thermal infrared visualization) — left. Fuego Volcano, Guatemala acquired with Sentinel-2 on January 20, 2019 (true color with slight infrared mix and highlights) — right. See the latter in full resolution on the Sentinel Hub Flickr account. 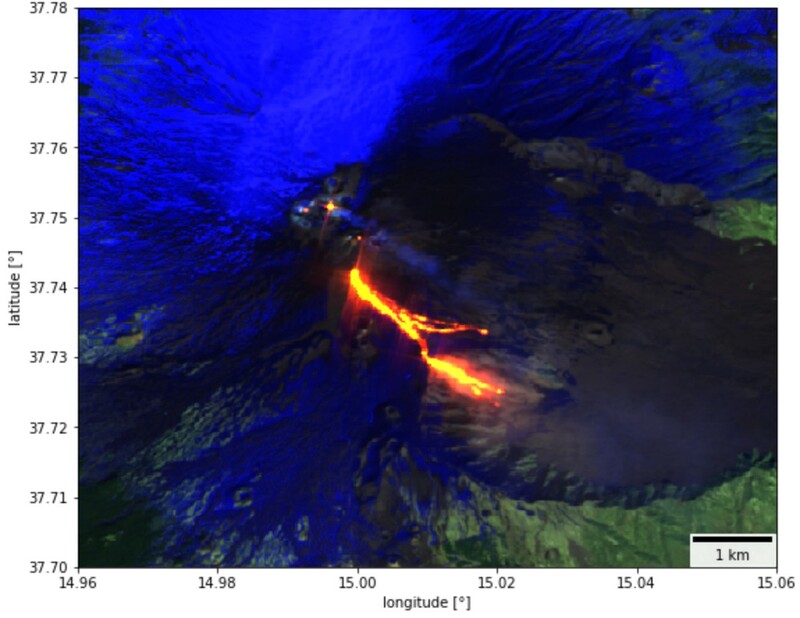 Radar data acquired with Sentinel-1 can be used for monitoring different phenomena such as lava flows, mudslides, ground fissures, floods, earthquakes, etc. Sentinel-1 image of the Mount Agung volcano in Bali, Indonesia acquired on November 20, 2017. See it in full resolution. Atmospheric sensors onboard Sentinel-5P identify the gases and aerosols released by the eruption and quantify their environmental impact. All of mentioned imagery can be simply accessed within EO Browser, which provides different visualization options for most appropriate exposure of the elements of your interest, long-term analysis, comparison of full resolution images and more. To take it a step further, you can also seamlessly integrate the imagery into your favorite GIS application by using WMS, and continue your analysis there. Etna volcano in Italy as seen on Sentinel-2 (true color) and Sentinel-5P (SO2 — Sulphur Dioxide) on December 24, 2018. 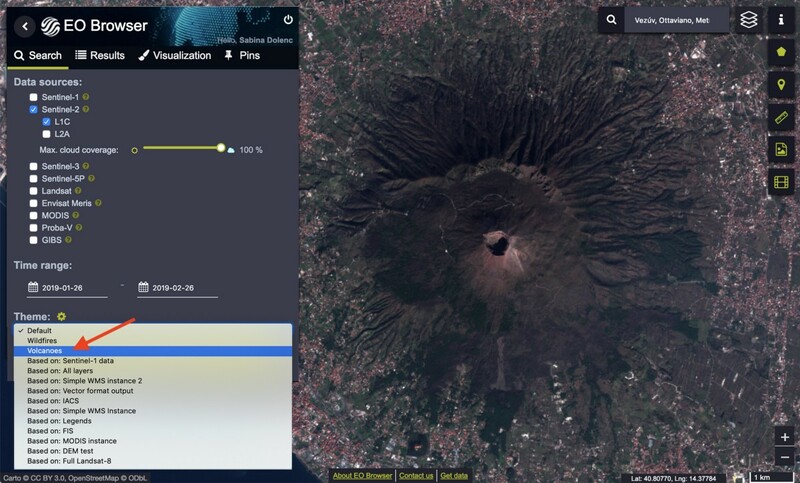 With a help of the comparison tool in EO Browser the source of the traces of SO2 emissions is clearly visible coming from the volcano after the eruption. If you inspect volcanoes, EO Browser offers several combinations of bands, such as a false color preset including bands B12, B11 and B4. Another similar combination often used while exploring volcano images is B12, B11, and B8. Kilauea volcano, Hawaii (Sentinel-2 images, acquired on June 7, 2018) — Inspect it in EO Browser with False color visualization, including bands B12, B11, and B4 (left), or with the custom combination of bands B12, B11, and B8 (right). Another possibility is to use a script completely customized for your case of inspection. With custom scripts it is easy to better focus on different aspects of eruptions, such as lava flows, ash plumes, ash trails, and heat signatures. Below is an example of highlighted lava on currently one of the most active volcanoes in the world, Piton de la Fournaise, using Pierre Markuse’s custom script in the EO Browser. What are your favorite volcano visualizations? See our GitHub repository with a collection of different custom scripts for more information and share your Remote Sensing expertise by publishing your own. 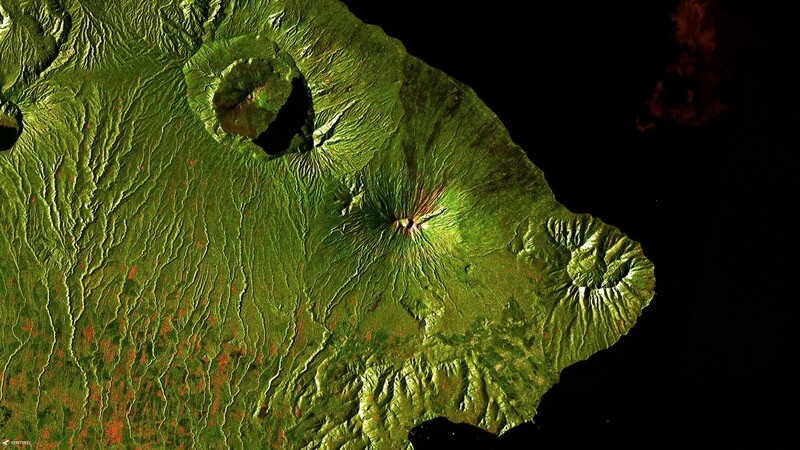 Piton de la Fournaise volcano, on the eastern side of Réunion island in the Indian Ocean as seen on the Sentinel-2 image acquired on May 7, 2018, processed by Pierre Markuse. Check his Flickr account for more astonishing satellite imagery! We invite you to continue exploring useful links and tools addressing various Earth observation subjects on our educational page. Different use cases are presented within Jupyter Notebook, which allows us to create and share documents with live Python code, visualizations and explanatory text all in one. To already existing use case devoted to wildfires, we have recently added another one dedicated to volcanoes. It was prepared in cooperation with the European Space Agency, and it showcases the eruptions of the biggest Sicilian volcano Etna, from January 23, 2017 till late April 2017. A combination of different bands exposing lava flow inspired us to illustrate Etna’s eruption. 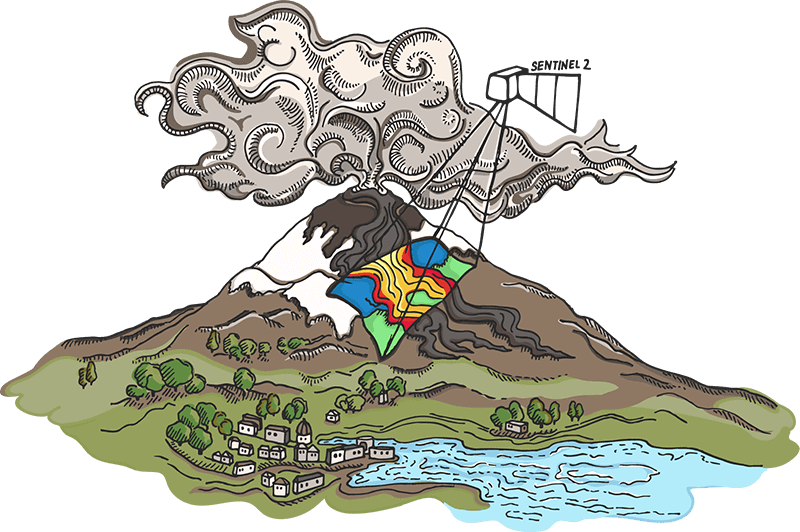 The volcano use-case introduces the basic physical concepts needed in order to understand the example, and demonstrates a way of observing such events from Sentinel-2 and Landsat 8 imagery. And no worries, even if you are new to Python, you will be able to follow the example and get a deeper understanding of how the satellite images can be used for studying volcanoes. Image of Etna, acquired with Sentinel-2 on March 19, 2017. In a composite of bands B12, B11 and B04 (right), we can easily distinguish snow from smoke, and hot lava flow. It appears red and yellow due to high values in B12 (red color) and in B11 (green color). However, in nature lava would be dark as seen in true color image (left). See our Jupyter Notebook for more details! Select a desired theme in EO Browser with the drop-down menu on the left. Another handy option to continue your exploration of the volcanoes with a help of satellite imagery is to check our newly integrated theme in EO Browser. Following the first preset theme on wildfires, you are now able to explore volcanoes in the same manner as well. The new theme includes read-only pins showcasing active volcanoes from different continents. Among selected ones are two Italian volcanoes Etna and Stromboli, Mount Nyiragongo in the Democratic Republic of the Congo, Erta Ale in Ethiopia, Mount Yasur on Tanna Island, Vanuatu, and Pacaya in Guatemala. Informative images can usually be found by browsing around the pinned image either spatially or in time (check previous or next available image). Etna, Italy (Sentinel-2 images acquired on December 26, 2018) — Different visualization options clearly indicate the hot spots and lava flow, which can’t be spotted with True color visualization. To experiment and create your own visualization you can also use the Custom option for either to combine desired bands or write your custom script. 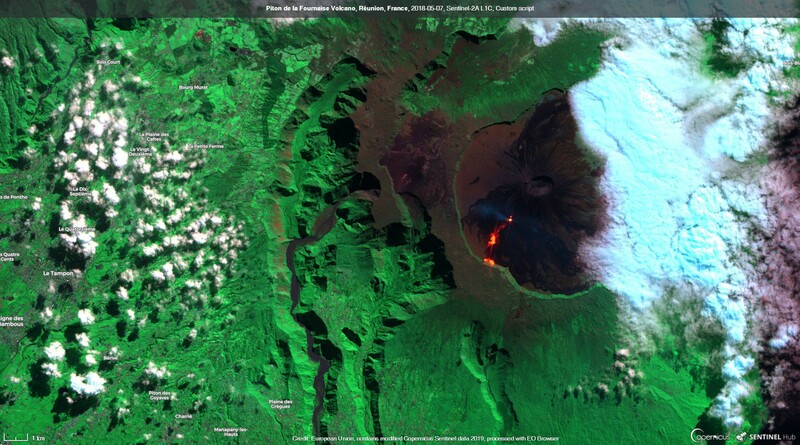 Mount Yasur on Tanna Island, Vanuatu (Sentinel-2 images acquired on December 2, 2018) — Images including True color, True color with lava flow exposure and False color (urban) visualizations. Our next contribution to the Sentinel Hub educational page will be devoted to air pollution, so stay tuned. However, we expect to include other cases such as flooding, deforestation, agriculture monitoring, ice melting, landslides, urban growth and similar as well. As much as we would love to expand the educational content on our own, we would appreciate your help to either raise awareness about remote sensing or prepare a new use-case, which could be shared through our educational channels. You can also contribute to the EO Browser theme by sending us a script or link to volcano that we can add to pins. A brief explanation how to proceed can be found on our Sentinel Hub Forum. Contact us, if you have any questions. We are also looking forward to your suggestions.